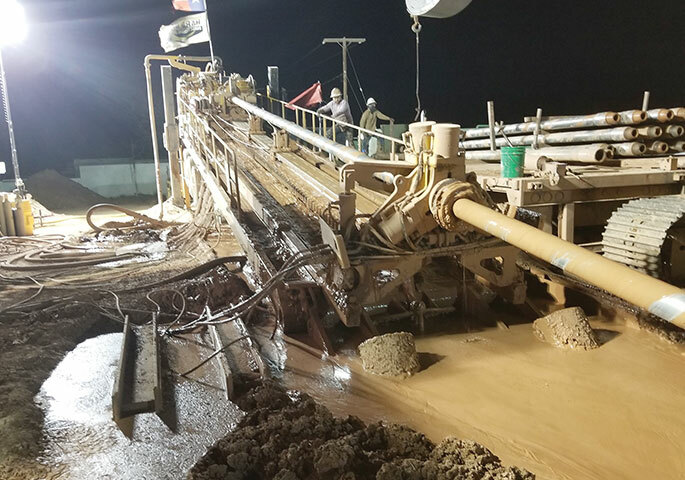 Hard Rock Directional Drilling LLC recently completed an 8,414-foot-long horizontal directional drilling (HDD) installation of 30-inch diameter steel pipe in Midland, Texas. Three smaller-diameter flex steel pipes were placed in the larger pipe before it was pulled in. The complex project included an intersect 5,000 feet from the starting side of the installation. Project owner was Fasken Oil and Gas and the pipeline contractor was Kingsley Construction Inc. The HDD segment is part of a new pipeline that will carry oil, gas and water from wells to be drilled. All product will be moved through the pipelines to a Fasken bank battery. The total length of the pipeline is 4.5 miles. Directional drilling was employed on the 8,400-foot portion of the route because it went through the middle of the city of Midland and crossed two major roads. “A challenge was, of course, the length of the installation and the diameter of the pipe,” said Cory Baker, Hard Rock general manager. “We spent a long time planning and assisting with the design of the project. Two Vermeer drill rigs were employed on the project: a D1000x90, which bored 5,000 feet, and a D500x500, which bored 4,000 feet. In fact, the crews were able to use the Tru-Tracker system the entire length of the crossing. Ground conditions were sandstone and limestone. The drill units used 8-inch mud motors. Twelve-and-three-quarter-inch bits were used to ensure there was sufficient annular space around tool joints to keep annular pressure of the hole as low as possible. The average depth of the crossing was 60 feet. Kingsley supplied support equipment for pipe handling, which included track hoes and side booms. Pipe was strung out and welded into one string on the exit end. Fasken had to acquire temporary work space from a ranch that ran beside the DOT right-of-way to provide plenty of room to lay out the entire length of the 30-inch pipe. Two 8-inch diameter and one 6-inch diameter flex steel pipes were placed in the 30-inch casing prior to pull in. The assembled string with flex pipes inside weighed 1.8 million pounds. The pipe was placed on 190 rollers for support. The large drill rig pulled in the pipe within 23 hours. The pipeline is expected to be in service by the first quarter of 2019. Successful completion of the project, Baker concluded, goes to Maxi Rig Division Manager Tom Forconi and the two Hard Rock crew leaders, Mario Diaz and J.R. Espinoza; general superintendent Leo Aguirre, as well as to the close coordination and cooperation with Fasken and Kingsley throughout planning and installation. Based in San Antonio, Hard Rock provides HDD planning, engineering and construction services.